Sales referrals are vital for B2B sales. Yet only 30% of B2B companies have a formal referral plan! Referrals are one of the most powerful channels for generating leads and closing sales. Marketers spend a lot of time discussing organic growth of social media: organic growth through referrals is key to successful salespeople. So why aren’t you growing your referral sales program? Often called referral selling or referral marketing, a customer referral program is a proven way to increase your sales. Still need convincing? Here are 17 statistics that will convert you to a sales referral And most of all, KISS: Whatever referral system you implement, make it simple for people to give you the referrals you want. Remember, Keep It Simple, Salespro! 2. Customers are 4x more likely to buy when referred by a friend. 3. Depending on the industry, a referral business closes and converts nearly 70% of the time. 4. 28% of millennials say they won’t try a product if their friends don’t approve of it. 5. 84% of buyers now kick off their buying process with a referral. 6. 90% of buying decisions are made with peer recommendations. 7. 92% of buyers trust referrals from people they know. 8. 47% of top performers ask for referrals consistently, versus only 26% of non-top performers. 9. 20 – 50% of purchasing decisions start with word of mouth. 10. 69% of B2B referrals result in a faster close time on sales. 11. Salespeople who actively seek and exploit referrals earn 4 to 5 times more than salespeople who don’t. 12. 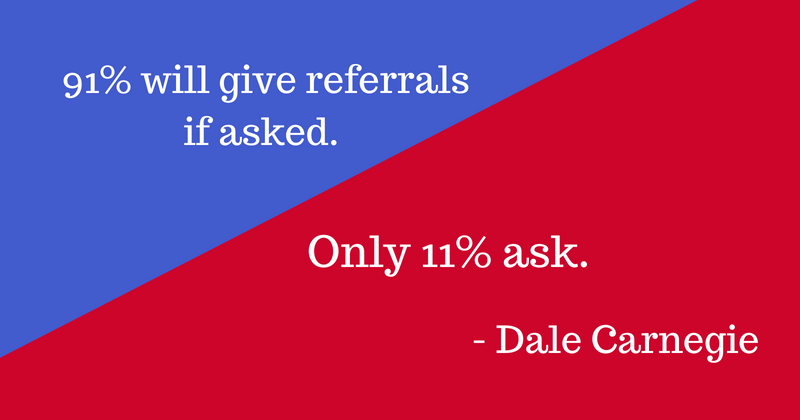 57.9% of salespeople only ask for 1 referral per month. 13. 74% of consumers identify word-of-mouth as a key influencer in their purchasing decision. 14. 85% of fans of brands on Facebook recommend brands to others. 15. 81% of U.S. online consumers’ purchase decisions are influenced by their friends’ social media posts and 78% are influenced by the posts of the brands they follow on social media. 16. 49% of U.S. consumers say friends and family are their top sources of brand awareness. 17. The lifetime value for new referral customer is 16% higher than non-referrals.